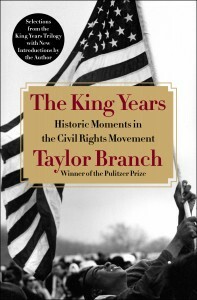 In Taylor Branch’s latest book, The King Years: Historic Moments in the Civil Rights Movement (Simon & Schuster), Branch has identified eighteen essential moments from the Civil Rights Movement, and providing selections from his trilogy, has placed each moment in historical context with a newly written introduction. The captivating result is a slender but comprehensive view of America in the turbulent, transformative 1960s, by our nation’s foremost authoritative voice on the subject. Hear an audio excerpt from the book’s introduction (click orange play button in the top left). The King Years is meant for general readers, but Branch designed it also as a teaching tool for the digital age. Starting in January 2013, from his home town, he will make this book the centerpiece for an experimental on-line seminar offered by the University of Baltimore. New, interactive technology promises an unmatched course on democratic leadership for a potentially worldwide audience. With this unique, handy addition to the literature on civil rights, readers can equip themselves for an uncertain future by absorbing hope from our resilient past. The King Yearsis being published in hardcover, ebook, and enhanced ebook editions. The enhanced ebook showcases additional videos and music throughout the text, making it a rich multi-media learning experience. Such resources include film of Walter Cronkite interviewing President Kennedy, King discussing his early plans for sustained demonstrations in Birmingham, b-roll of sit-in demonstrations, and tracks of Freedom songs.